Nature's Lab Triple Strength Fish Oil provides all the essential omega-3 fatty acids you need from wild-caught sustainable fish. At three times the amount of EPA and DHA fatty acids that conventional strength fish oil contains, Nature's Lab Triple Strength allows you to take fewer softgels for the same daily health benefits. The average person takes in too much saturated N-6 animal fats in their diet and not enough Omega-3 fatty acids. This leads to an unhealthy N-6 -- N-3 fatty acid ratio. Nature's Lab Triple Strength Fish Oil contains 650 mg of Omega-3 EPA and 650 mg of Omega-3 DHA per serving to help optimize and balance fatty acid intake. * That's over 1,200 mgs of the critical Omega 3 Fatty Acids your body needs! As we age, the body's natural ability to make EPA (Eicosapentaenoic Acid) and DHA (Docosahexaenoic Acid) fatty acids declines. 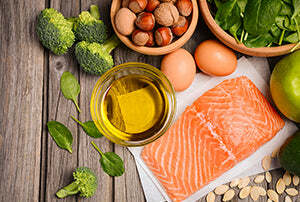 Many people do not eat enough Omega-3 rich foods like fatty fish, walnuts, or soybeans to maintain healthy levels.Nature's Lab Triple Fish Oil helps restore EPA and DHA to healthy levels without the need to swallow large amounts of oil. Easy-to-take softgels make supplementing your diet simple. Nature's Lab Triple Strength Fish Oil is sourced from small species of wild-caught sustainable fish, such as sardines and anchovies. 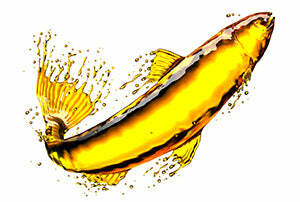 The oil is then purified by molecular distillation to remove dioxin, PCBs, and mercury, which are all found in fish. The potency and purity of each bottle that comes out of our manufacturing facility is carefully checked, with over 90 quality control check points in place. This ensures that all the original benefits of the raw source oil is retained in the final product. Suggested Use: As a dietary supplement, take 2 soft gels daily with meal or as directed by a qualified healthcare practitioner. Other Ingredients: Gelatin, glycerin, purified water, and mixed tocopherol. Free of: Sugar, Salt, Dairy, Eggs, Peanuts, Tree Nuts, Yeast, Wheat, Soy, Gluten, Titanium Dioxide, Artificial Colors and Flavors. Warnings: Pregnant or lactating women and people with known medical conditions and / or taking drugs should consult with a qualified healthcare practitioner prior to take dietary supplements. Manufactured in Ethyl Ester form (EE form).